Steel epoxy powder coated case and splash proof. Withstands the rigors of an adverse environment: heat, humidity and salt air. Circuit boards are protected with an acrylic coating for maximum corrosion resistance. Temperature sensors ensure that power components will always operate within specified limits, if needed by automatic reduction of output current under extreme environmental conditions. For status monitoring and to easily adapt the charge algorithm to a particular battery and its conditions of use. 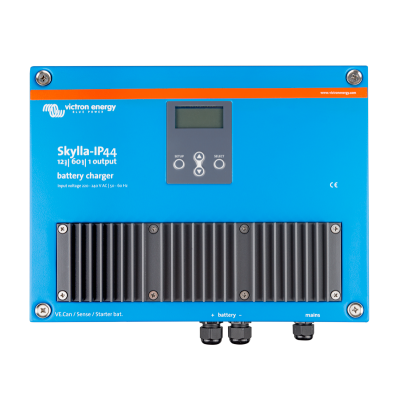 If, in order to quickly charge a battery, a high charge current in combination with a high absorption voltage has been chosen, the Skylla-IP44 will prevent damage due to excessive gassing by automatically limiting the rate of voltage increase once the gassing voltage has been reached. The Storage mode kicks in whenever the battery has not been subjected to discharge during 24 hours. In the storage mode float voltage is reduced to 2,2V/cell (26,4V for 24V battery) to minimise gassing and corrosion of the positive plates. Once a week the voltage is raised back to the absorption level to ‘refresh’ the battery. This feature prevents stratification of the electrolyte and sulphation, a major cause of early battery failure. In order to compensate for voltage loss due to cable resistance, the Skylla-IP44 is provided with a voltage sense facility so that the battery always receives the correct charge voltage. 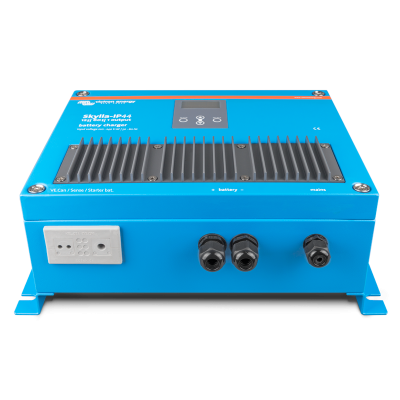 As a result of the excellent control circuit, the Skylla-IP44 can be used as a power supply with perfectly stabilized output voltage if batteries or large buffer capacitors are not available. Simple charger on-off control can be implemented by connecting a relay or open collector opto coupler output from a Li-Ion BMS to the remote control port of the charger. Alternatively complete control of voltage and current can be achieved by connecting to the CAN bus port.